Iva, from Slovakia, visited Beijing for a short time last month. It was her first time visiting China, a place where she has abundant possible job opportunities. However, her interest is not finding the perfect job; it is finding her Chinese soul mate. Iva called Metropolitan and asked if we had contacts for credible blind date agencies, saying that she plans to use these agencies to help her find her perfect match. Iva speaks highly of Chinese men. "First, I feel good energy from Chinese men in general. I feel they are more open and kindhearted compared to the majority of Western men. I think that most Western men's personalities are a bit too harsh for my style," she said. "I also like the Asian look because it shines with simplicity, intelligence and honesty, which I find attractive." According to her, none of the Asian men she has met are dishonest or base their interest in her by how pretty she is or what her status is in society. The reporter from Metropolitan recommended that Iva try popular Chinese dating agencies Jiayuan.com and Zhenai.com. However, Iva said that she will have difficulty with the agencies since she does not speak Chinese. "I think I will start with at least posting my profile on the net with these agencies. It will not be easy, but I believe anything is possible," she said. When it comes to Eastern European women, the media and public usually connect them with high yanzhi (attractiveness). On China's Quora-like platform Zhihu, there is even a post asking why Eastern European countries have so many beauties. A web user commented below the question that Eastern European women's competitive edge lies in their genes - they are generally taller with a relatively smaller frame, they have fair skin, blonde hair and big eyes, all of which fit the standards of a perfect appearance for a Westerner in the eyes of Asians. 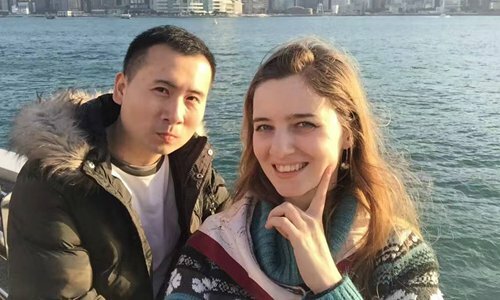 In recent years, it is not unusual to see news reports in domestic media about Eastern European women marrying Chinese men. Metropolitan interviewed three other women from Eastern European countries who shared their insights about Chinese men as well as their Chinese love stories. Are Eastern European women the most beautiful? Anna: Of course I am very pleased to hear that Eastern European girls are pretty because I belong to Russia, right? But in my opinion, Ukrainian women are the most beautiful. Jenny: Beauty needs to come from inside. I know that Chinese prefer big eyes, large noses and white skin. However, in my country, girls like to go to the beach and shaitaiyang (to get tan). Irina: There are a lot of beautiful girls in our country. I would say the countries [with the largest number of beauties] are Moldova, Russia and Ukraine. Chinese girls are beautiful, too. Anna: I have been married to my Chinese husband for one year. How we met was very interesting. He was looking for a Russian because he wanted to go there to travel. He found me on vk.com (the largest European social network platform with more than 100 million active users). He saw my name. My name is Anna, so it appeared first on the list in front of him. It was also because of location because at that time we were both in Shanghai. He knows how to behave with foreign women, while most Chinese guys are very shy. Jenny: I went to China in 2013 to study Chinese at a university. At that time, I really wanted to make friends with Chinese. So, I added many friends to my WeChat and QQ, and eventually, I found my Chinese boyfriend. Irina: We met in the dining hall of the Beijing Language and Culture University. After my part-time job, I would go to the dining hall for dinner. One day, a Chinese man approached me and asked me if he could sit with me, and I said yes. He saw I was reading a book, and he thought I could teach him English. What are some of the strengths and weaknesses of Chinese men? Anna: In Chinese, it would be caoxin (to worry about). If I get a bad grade on an exam, have trouble at work or can't decide on a bag, he always wants to control the situation and tell me how I could do it better, even if I don't ask. Chinese men are very loyal to their family. When you marry a Chinese man, you also marry his family. Every time there is a holiday, we go visit his family together. Jenny: Chinese men really pay attention to how to take care of you. They buy you a lot of things. But in my country, at the beginning of the relationship, maybe you [a man] don't have to pay for everything. We [Belarusian women] are more independent in this case. Irina: He has a lot of patience, especially with me. I am the fire, and he is the water. When I am very stressed or angry, he knows how to hong nüren (make a woman happy). Patience also means love. If I was married, for example, to a Russian man, he would not accept me. Maybe he will just say, "Bye, bye." My husband is not very romantic. This is maybe his quedian (weakness). Sometimes, I really want him to be more romantic with me. I express too much, but he doesn't show his feelings; maybe he is thinking it, but he just doesn't tell me.